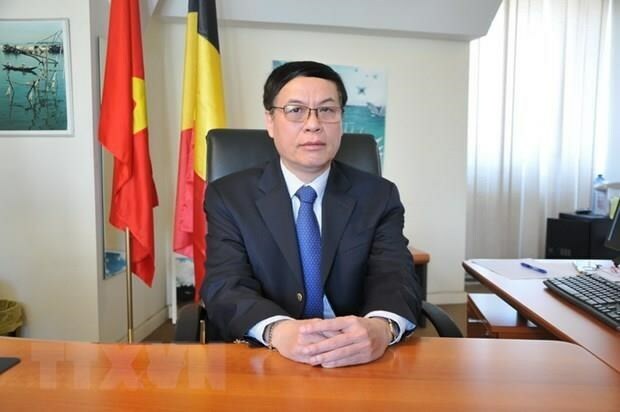 Brussels (VNA) – Vietnam regards its relationship with the European Union (EU) as a priority in its foreign policy, Vietnamese Ambassador to Belgium and head of the Vietnamese mission to the EU Vu Anh Quang has said. The diplomat made the statement in an interview with the Vietnam News Agency ahead of the visit to the European Parliament (EP) by Chairwoman of the Vietnamese National Assembly Nguyen Thi Kim Ngan. The visit takes place with relations between Vietnam and the EU as well as the EP in particular at their best level ever, Quang noted. He said Vietnam and the EU signed and approved the Agreement on Comprehensive Partnership and Cooperation (PCA), which was ratified by the EP and the Vietnamese legislature in late 2016. The two sides have also completed negotiations for a free trade agreement (FTA) and an investment protection deal, which were passed by the European Commission (EC) and submitted to the European Council for consideration. The documents will also be sent to the EP and the Vietnamese legislature for approval in the future. Vietnam is the second country in the Association of Southeast Asian Nations (ASEAN), after Singapore, to reach a FTA and an investment protection agreement with the EU, the ambassador said. Quang highlighted increasing trade between Vietnam and the EU, saying the EU is Vietnam’s second largest trade partner, after China, and the country’s second biggest importer, after the US. In 2018, two-way trade exceeded 55 billion USD. Vietnam ranked second in ASEAN, after Singapore, in terms of trade revenue with the EU. He praised the development of the Vietnam-EU relations in other spheres like political dialogues and security and defence cooperation, emphasising that few ASEAN member countries have similar relations with the EU. The Vietnamese NA and the EP play an important role in ratifying the PCA, he said, adding that both sides will complete procedures to approve the Vietnam-EU FTA and Trade Protection Agreement. They are the first new-generation agreement the EU has signed with a middle income earner like Vietnam. According to the ambassador, the Vietnamese legislature and the EP will have to do more to elevate Vietnam-EU relations to a new height. The EU has attached importance to the relationship with Vietnam in its policies on enhancing relations with Asia-Pacific in economics, trade and investment, politics and security. The EU has also acknowledged the significant position of ASEAN in its cooperation with Asia-Pacific, and Vietnam’s role in the strategy is indispensible. Despite unforeseeable direct impacts of Brexit on EU member countries, EU authorities are still willing to hold result-oriented discussions with Vietnam to enhance the relationship, he said. Regarding measures to enhance bilateral cooperation, the Vietnamese diplomats said there should be more high-level exchanges between the two sides in both Hanoi and Brussels as well as within the framework of international conferences and multilateral forums. The Vietnamese NA and the EP play an important role in elevating bilateral relations, including the early ratification of the EU-Vietnam Free Trade Agreement (EVFTA) and the EU-Vietnam Investment Protection Agreement (EVIPA). Leaders of both national assemblies will discuss measures to further develop the Vietnam-EU partnership, he said, noting that collaboration between the two countries should be intensified to fully tap their potential and foster links between Vietnamese and EU businesses. During her visit to the EP in Belgium, the Vietnamese to legislator is scheduled to meet with Belgian Presidents of the Chamber of Representatives and the Senate, and this has significant meaning to bolster Vietnam-Belgium relations as well as enhance the implementation of free trade pacts and the EVIPA, he said.